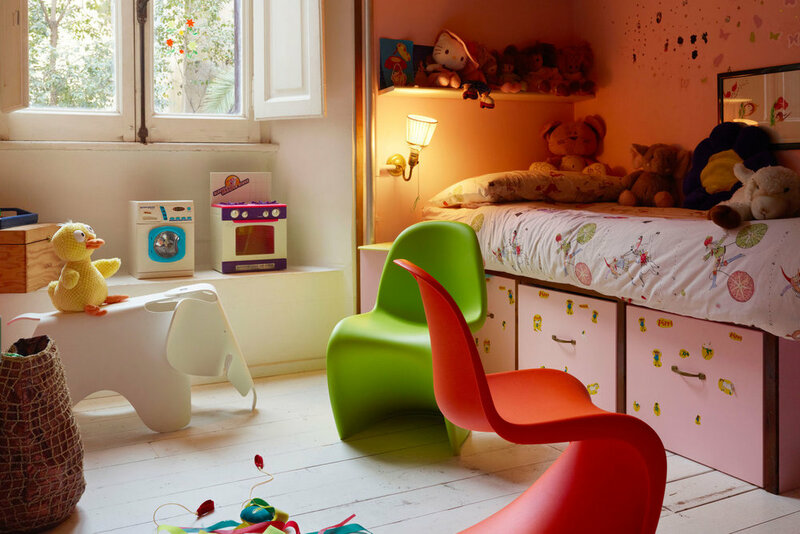 Design classics are in abundance and many designers do a small selection of fun kids products. The most icon being those designed by Charles & Ray Eames and produced by Vitra. All designed in the forties have such longevity that they are desirable today and for many decades to come. Last years Barbican retrospective celebrated not just their work by their life together. With touching letters from their courtship. The most icon Eames kids piece has to be the toy elephant. Originally made of plywood in 1945. However, this prototype never went into production. Which is such as shame as having seen it at the Barbican in it full glory I think a plywood version would be a hit! However it is available today in several colours made from strong polypropylene with a matte finish. Its a fun accessory for a child playroom...probably a bit more fun than the plywood version!? These mobiles are incredible sophisticated (not quite the rainforest range from Fischer Price!). 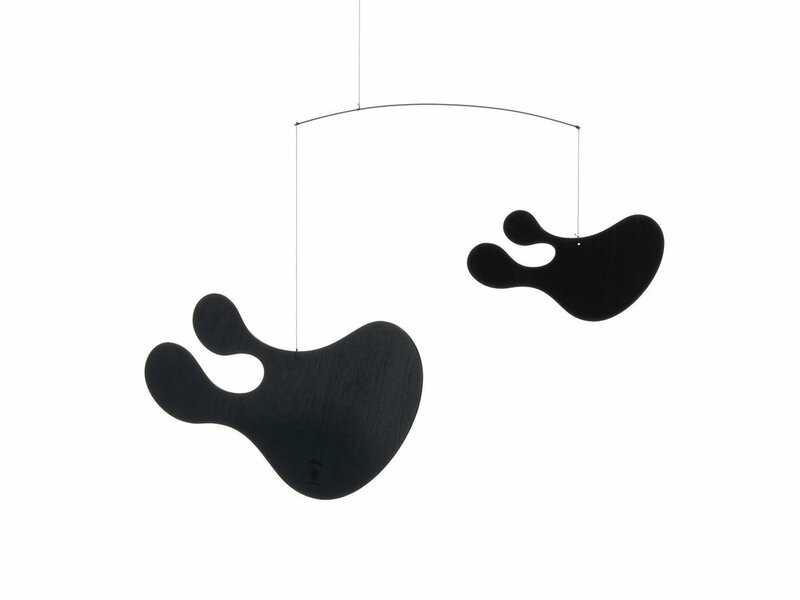 Made from Plywood Mobiles (1941), the shapes are strongly reminiscent of Ray’s artwork and graphics, which were hung from the ceiling of the Eameses’ apartment in Los Angeles. The perfect baby gift! The 'Hang it all' coat rack designed by Charles and Ray Eames, which comes in a variety of colour combinations, encourages children to literally hang up all their things. With its colourful wooden balls, 'Hang it all' is a cheerful alternative to conventional coat hooks – and not just in children's rooms. I personally have my eye on the raw wood version for our hallway. Functional design classics. "Charles Eames, born 1907 in St. Louis, Missouri, studied architecture at Washington University in St. Louis and opened his own office together with Charles M. Gray in 1930. In 1935 he founded another architectural firm with Robert T. Walsh. After receiving a fellowship in 1938 from the Cranbrook Academy of Art, he moved to Michigan and joined the faculty the following year. In 1940, he and Eero Saarinen won first prize for their joint entry in the competition 'Organic Design in Home Furnishings' organised by the New York Museum of Modern Art. During the same year, Eames became head of the department of industrial design at Cranbrook, and in 1941 he married Ray Kaiser. Ray Eames was born as Bernice Alexandra Kaiser in Sacramento, California, in 1912. She attended Bennett College in Millbrook, New York, and continued her studies in painting under Hans Hofmann through 1937. During this year she exhibited her work in the first exhibition of the American Abstract Artists group at the Riverside Museum in New York. She matriculated at the Cranbrook Academy of Art in 1940 and married Charles Eames the following year.